Hawaii Pacific University Dean Helen D. Varner has been given a Lifetime Achievement Award by the International Association of Business Communicators, Hawaii Chapter. >> Recognition: Lifetime Achievement Award from the International Association of Business Communicators, Hawaii Chapter. She is only the second person to receive the award in the chapter's 34 years. >> Background: Varner has worked in advertising, public relations, desktop publishing, journalism, corporate communication and crisis communication. 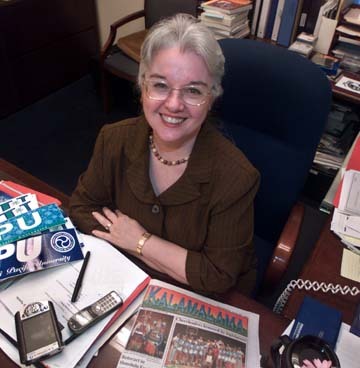 Her other awards include the HPU "Trustees Award for Teaching Excellence" in 1995 and "Woman Leader of the Year" by the Organization of Woman Leaders in 1996. What are the biggest communications mistakes companies can make in a crisis? One of the biggest mistakes people can make in business is to hope that nothing bad will ever happen to them, and so they don't plan for it. That's not the biggest mistake in crisis communication but unless you are prepared for a crisis -- if you're taken by surprise -- you cannot respond very well. You absolutely have to be prepared. Every single organization will have a crisis. We think about plane crashes and we think about an employee going berserk, but a crisis might be a rumor that goes around about the quality of your product. A crisis might be a flaw in your product that you discover in your internal testing. When something bad happens, the biggest mistake you can make is like Bridgestone/Firestone. Rather than trying to correct a flaw, they tried to cover it up. Effective crisis communication is ensuring that accurate information gets to everyone who is affected. Martha Stewart's situation was she had the wrong conversation with the wrong guy, and then lied about it. Is that a crisis? It has absolutely ruined her company. The way you handle it is how you demonstrate the integrity, the quality, the basic character trait of a corporation, and that's how people judge us. How do you rate Gov. Lingle's public relations efforts? I will tell you that in many ways I am a fan of Gov. Lingle. I think that she is extremely straightforward and she knows how to release information. She is a very polished speaker. She is very concise. Most politicians talk too much and take too much time to explain something. Because of that ability -- as you know she was trained as journalist -- she is more persuasive than a lot of politicians and I think that is why she has gotten a lot of support for things. I admit to being a news junkie. I even watch (British Prime Minister) Tony Blair. The guy is fabulous. What a communicator. He is witty. He is extremely concise and he has a way of cutting to the quick. People talk 80 percent of the time and listen 20 percent of the time and effective communication is just the opposite. How would you rate the quality of news coverage in Hawaii? It would really depend on exactly what you're talking about. I think the news coverage tends to be a little parochial. Because we are isolated and Hawaii tends to be family oriented, a lot of times we place tremendous focus on local people and local issues. I would like to see Hawaiian media have more of a world view, more of a national view. I wish the American Idol girls lots of luck, but they have been headline news for weeks, and that's more than enough. People in Hawaii ought to be better informed about the Asian economic situation, and they're not. Does the Bush administration come off as secretive? I don't think so. Let's put it this way. If Donald Rumsfeld is watching CNN, he might be getting the same information I am. We know that Saddam was using CNN as a primary source of information. I think they're trying to deal with a very rapidly changing situation with more sources of information than anyone can humanly monitor and a very well-informed population, and that's tough. Because of the instantaneous nature of news coverage today, I don't think they can keep information from the public. Twenty five years ago that wasn't the case. What got you into reporting? I was always a curious brat. I think that's a No. 1 characteristic for a reporter. And then my mother was a columnist and my stepfather was a managing editor for the Galveston Daily News in Texas. Did I have a choice? What made you switch to public relations and advertising? My husband was in the military and I was transferred with him and there wasn't a newspaper job open. So I went to work in an advertising agency. I found advertising gave me an opportunity to be creative, which I found extremely interesting. I later found companies don't do a good job of telling their stories, and that was a challenge. And then I got into education and I have never looked back. It has been a tremendously rewarding career.